On an icy mid-December day, I met Joseph Colin in the hamlet of Gamay for a full day of walking the vines of St. Aubin. Location is everything and so much about Burgundy revolves around rocks and dirt. Nowhere in the world have the fortunes of the noble Chardonnay grape taken such a serious turn toward the upper echelons of white wine fashion than the finest plots in and around these cool hills. Twenty to thirty years ago if you ended up in Gamay or the neighboring Saint Aubin, you were probably lost. 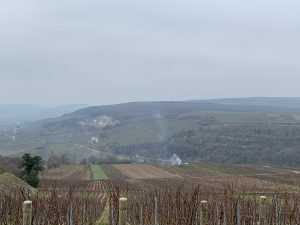 It took a fairly serious detour off the beaten track when visiting the big-name villages of the Côte de Beaune to end up in this side valley, or what the French call the arrière-côte. 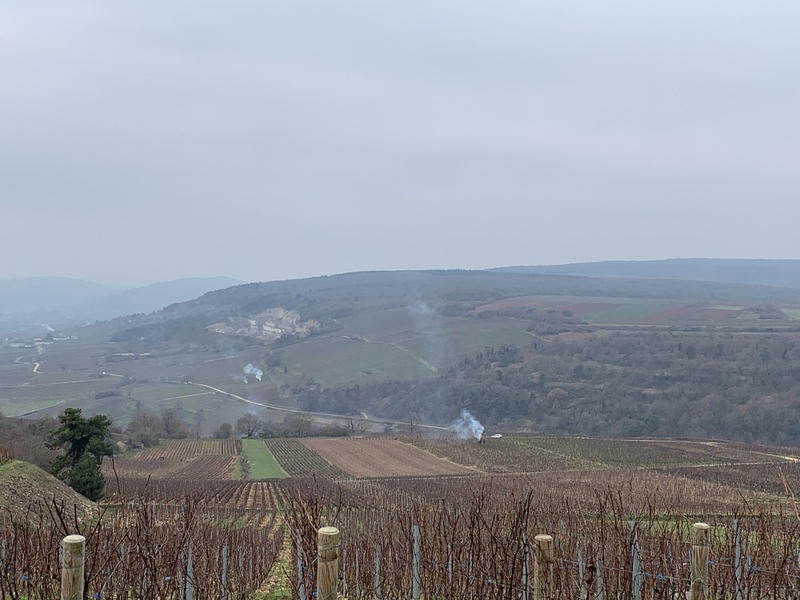 Driving south from Beaune you must take a right off RN74 (the main vein of La Côte) and pass through the storied plots of Chassagne-Montrachet and Puligny-Montrachet, with the hill of Mont Rachet shadowing you on the right, before arriving in the sleepy little village of Gamay. Joseph met me with a big smile in front of his cellar. This used to be the old winery of his father Marc Colin, who still lives next door. 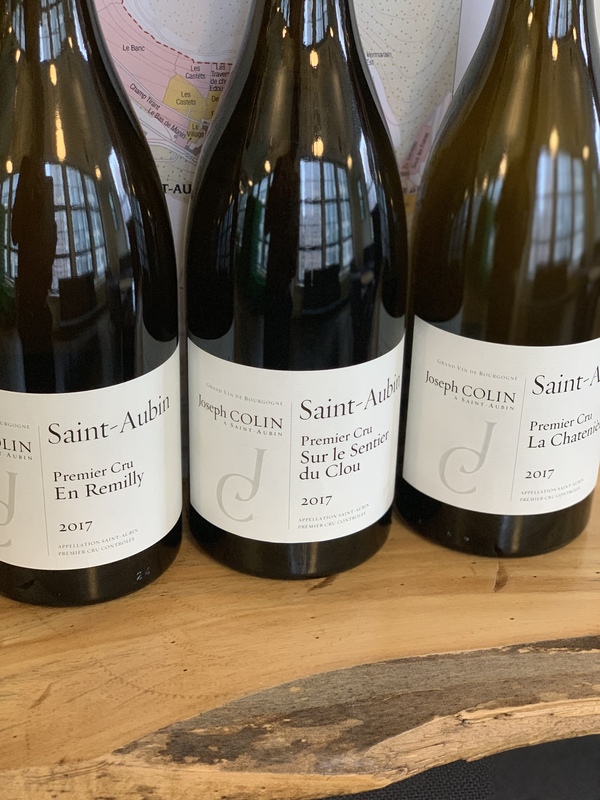 Marc was one of the original leaders in raising the quality and image of St. Aubin over the last 30 years; he also happens to be the retired dad of some seriously talented winemakers. The oldest son, Pierre-Yves, worked with Marc and Joseph for 10 years before starting his now famous PYCM winery in 2003. After Pierre-Yves left, Joseph ran Domaine Marc Colin with his two younger siblings. In 2017 Joseph followed in his older brother’s footsteps, by peeling 6+ hectares from the original family property to begin his own story. (Joseph’s two younger siblings continue to run Domaine Marc Colin). This process of bestowing the oldest children with some of the most beautiful vines in the world to make their own way in the wine world is a Burgundian tradition. In the case of the Colin family, the parcels they were given include some of the choicest nuggets of Chardonnay soil on the planet. The mother lode is centered in and around St. Aubin, Puligny and Chassagne. Before leaving the cellar, he points to the vineyard across the street. 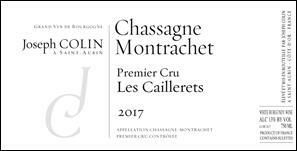 It is the imposingly steep Premier Cru La Chatenière, one of his eight heirloom parcels of St. Aubin. He believes that this abrupt and angular plot is the perfect way to start our day. The appellation of St. Aubin is distinctly unique from most of the Côte de Beaune. 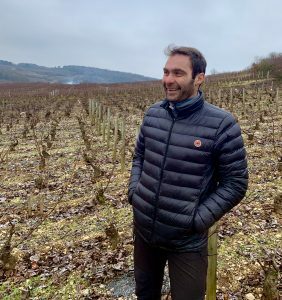 Rather than the gentle south orientation of the majority of the villages, the hamlets of Gamay and St. Aubin form a bowl that tends to twist and turn with a dizzying array of slightly different expositions, altitudes, gradients, rocks, and soil types. Most of the top vineyards are also at fairly high altitudes that range from 300-400 meters for the top parcels. It is crucial to get onto the ground to get the feel of the wines and the nuanced crus and exposures. 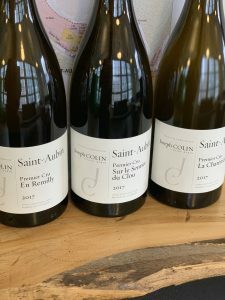 Joseph warns that even hours spent tasting St Aubin is insufficient to obtain a full understanding of the feel and soul of the plots and the wines. You must walk through and experience the dirt, rocks and vines firsthand. As we walk up La Chatenière, he points to a massive slab of stone that sits in front of us, what the French call La Rôchemère, or “mother rock.” Joseph says, “I like to think of La Chatenière as sharp, edgy and racy with a sleek saline feel that is ’nervy’ as the French like to say. This is a vineyard with angles and where a tiny layer of dirt hides the immense bedrock below. Like the site, the wine gives no shelter.” It is a wine with no make-up, just a bracing and ruggedly handsome beauty that makes many of the wines in this village so irresistible and are the envy of every overripe, oaky and buttery Chardonnay you like to make fun of. 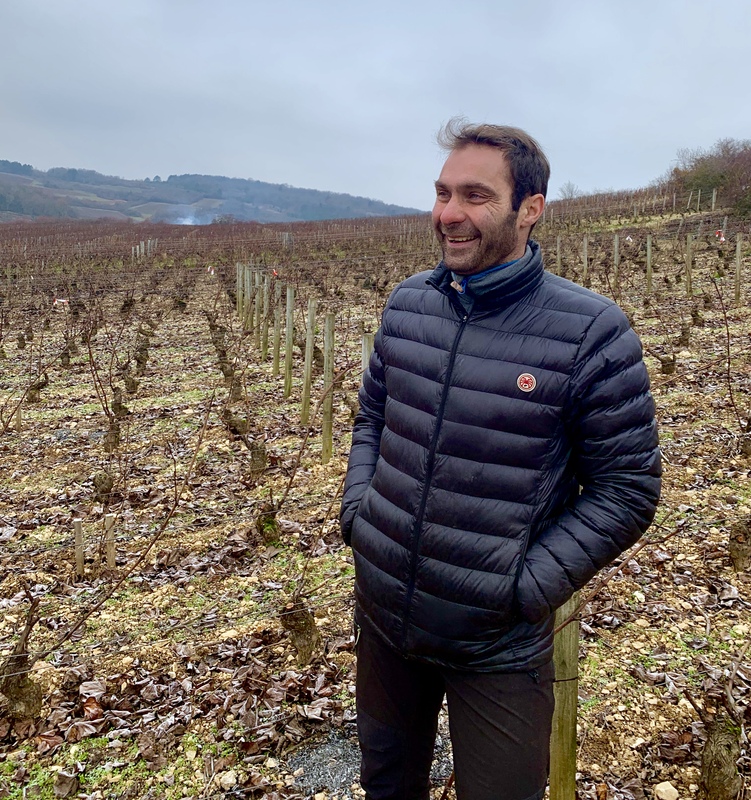 Having started working with his father full-time at such a young age, Joseph knows the rocks and vines in this white Burgundy mecca like few others. As you would expect, the Colin children were involved in every aspect of wine, as they were part one of the leading families of the region. It does not take long to realize that the heart of this 44-year-old is firmly rooted in his vineyards. Leaving Chatenière, we stop for the tenth time or so to take another photo of one of the gorgeous stone shelters that litter this area, called Cabottes. It was Joseph’s great uncle who was instrumental in helping find and preserve these historic structures. These relics are the soul and history of a time forgotten in the wine world. 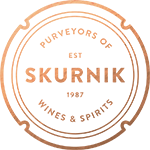 In this rugged appellation, some 130 have already been found, with likely many more that have yet to be discovered. These were the refuge for workers for hundreds of years, in existence due to the long distances between hamlets and the laborers. They remain a testament to the dedication for cultivating remote and difficult terrain in France. 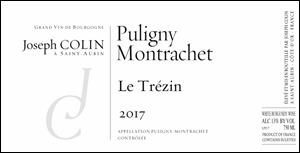 Near the intersection between Puligny and Gamay, Joseph points to his stunningly rare village-level Puligny-Montrachet Le Trezin vineyard. At almost 500 meters, this is the highest in the area and is a limestone bomb, with tons of larger chunks of rock. The lethal combination of 60-plus-year-old vines, serious stone, and a frequently cool wind make for a seriously chiseled and salty Puligny. As we continue towards Puligny, Joseph picks out some very impressive slabs of rock that catch the eye of a vigneron and casually throws them onto the Murgers, or “rock piles.” These makeshift “walls” that are between every Cru in this area are a result of years of what the French sarcastically call “harvesting rocks.” Every year more seem to make their way to the surface and need to be removed. These can be deadly tractor and vine root breakers of a critical nature – yet another of the “joys” of farming close to the rock. As we work our way up the hill toward the top of Mont Rachet, we end up in the elite sector of Premier Crus that have recently begun to get some serious recognition. The most coveted are those sitting nearest to Chassagne and Puligny (Le Charmois on the Chassagne side, En Remilly, Les Murgers-des-Dents-de-Chien and La Chatenière on the Puligny side). 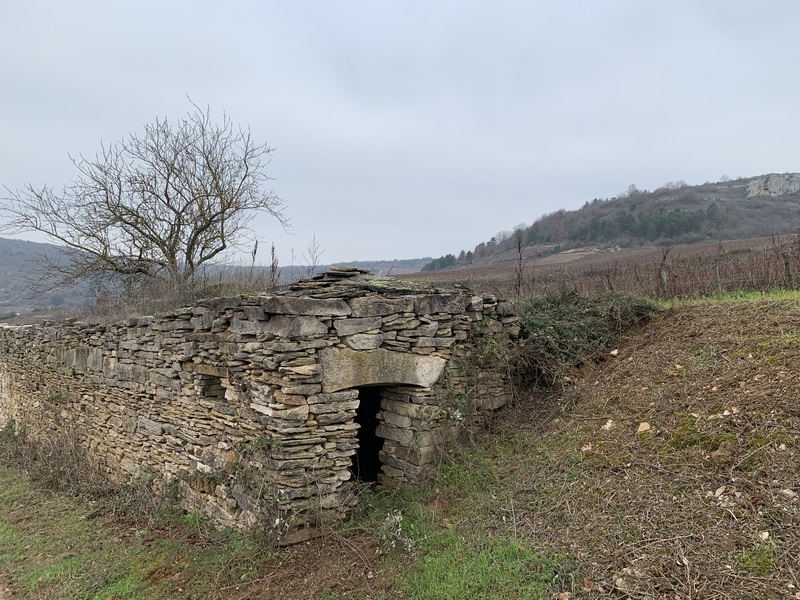 These sites are becoming a part of white Burgundy nobility – the proximity to the most famous Grand Crus of Puligny-Montrachet has done nothing to hurt their popularity. 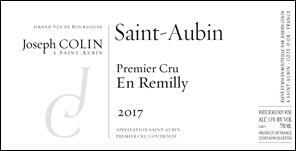 Joseph and I eventually find ourselves standing in the iconic En Remilly Premier Cru, a rocky plateau with pure limestone on the surface in some spots that soaks up the sun. Here we are only 100 or so meters upslope from Chevalier-Montrachet and Le Montrachet. It is one of the finest overlooks in the area with views down to Gamay, St. Aubin and the vineyards of Chassagne. The magic of this site combines the mineral freshness of the Mont Rachet and the silky fruit that this hilltop delivers. The combination of lacy succulence and acidity is addictive and one of the reasons it has become a bit of a cult wine. In bottle, it comes together in a glorious tightrope walk between salty precision, florality and layered fruit. Joseph likes to describe En Remilly as “embodying the brightness of the vast sky and sunlight that you take in while standing on the crest of the Mont Rachet.” This is a seriously soul-filling place that makes you dream of what the Burgundy of yesteryear looked like as you gaze for miles.